Warm 2 tablespoons of olive oil in a pot. Add 1 teaspoon of each: mustard seeds, turmeric, coriander powder, and cumin powder. Mix the spices well with the oil then add salt, crushed garlic and ginger paste. Add the chopped onion, tomato and chillies. Add the potato cubes and cauliflower florets. 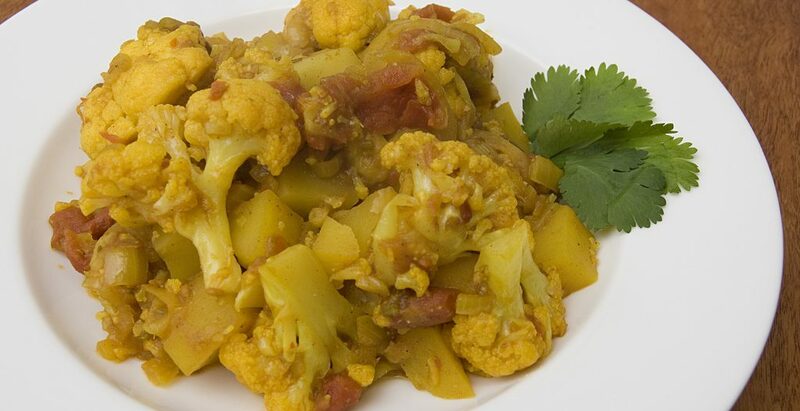 Mix well with the sauce and cook until the potatoes and the cauliflower florets are soft. (Add a bit of water if needed). Add 1 teaspoon of Garam Masala and mix well. Garnish with chopped coriander leaves and serve with Naan bread.